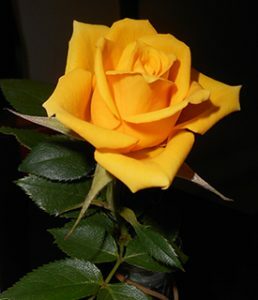 Welcome to the San Fernando Valley Rose Society’s website. We are a group of rose enthusiasts, from novice to expert, in the San Fernando Valley, that meets monthly to share in the joy of growing roses and to promote this joy in others. The club was established in 1960 by several people who experienced the joy of growing beautiful flowers and roses of exhibition quality. They wanted to share this experience with others that had the same joy at seeing a perfect rose blooming in their garden. All who are interested in growing beautiful flowers are welcome to join us, even if all you want to do is smell the roses. 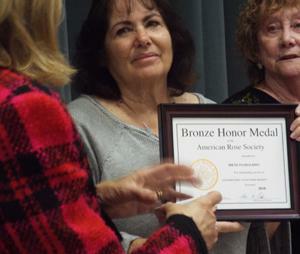 We hold monthly meetings, have related presentations, arrange garden tours, and discuss other flower growing subjects. There are even several Consulting Rosarians in the club to answer questions when they arise. The SFVRS is available to help you learn more about growing roses. Why not join us today for good fellowship and learn how to grow beautiful roses. Check the Meetings page for our next events.